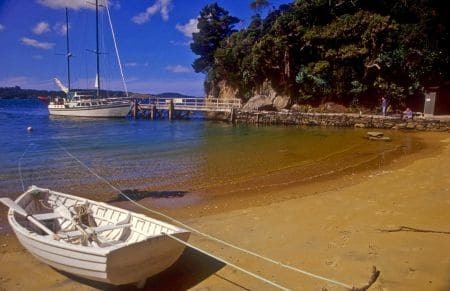 Stewart Island is a magical place, best savoured in peace and at a relaxed pace…..
Not for us the rush and bustle, nor as part of a crowd…. usually never more than 6 per guide. and now as Dept of Conservation concessioned guides..
and what Island life is like…. There are two Island “stories” which parallel and compliment each other. The first story is the Islands Natural History story, which is so well illustrated on Ulva Island, and indeed also shows us something of what New Zealand was before people first arrived… not so long ago, really. 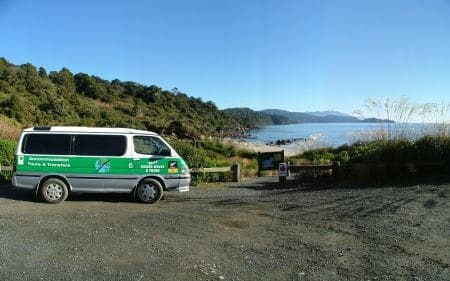 My (Peters) position as Forest Service Ranger for Stewart Island in the late ’60’s and also the many research expeditions I field managed then, and while a fisherman and latterly as a charter skipper gives me an unique insight into the changes that have occurred over the last 50 years. The second is the “People” story of the Island, and the life that our early residents experienced here, and how their story backdrops the present community. Iris’s position as relieving District Nurse for 15 years gave her an “intro” to many of the Islands older residents, as did my position as Ranger, when I would actively “pick the brains” of many of the older fishermen and their families for information to assist me in my duties. … sadly I wish I had had the advantage of some of the cleaver recording systems now available to better record the stories. We try to present these two separate, but interwoven stories in our two tours, with the Ulva Island tour more focused on the natural world, and the road tour exploring the “peoples” story. Unless forced by weather we generally limit party size to six or less. While not fully disabled capable, we do try very hard to help disabled guests enjoy both tours. We have taken wheelchair bound guests to Ulva, and recently a gentleman with a leg off went on crutches over the whole walk.